From Wednesday January 16 to Friday January 18 the international network, Democracy R&D, whose first principle is the use of “sortition (random selection) to assemble representative groups of everyday people“, will be meeting for the second time, this year in Paris. Three directors of the Sortition Foundation will be attending, along with members of around 21 organisations and several “guest participants”. This year sees the network growing, with the inclusion of Involve, DemSoc, the RSA, DeliberaBrasil and Génération Nomination, alongside many of the participants from last year’s meeting in Madrid. The meeting will also discuss the “Great National Debate” in France — a series of regional sortition assemblies — in response to the Gilet Jaunes protests. It will also be very interesting to hear from the participants from Madrid, who were instrumental in that city becoming the first in modern Europe (and possibly the world?) 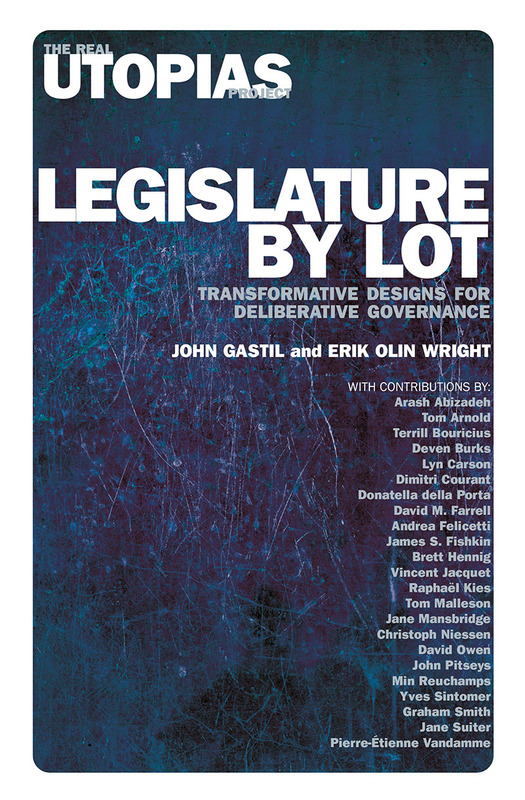 to institute a sortition body (called “The Observatory”) alongside an elected assembly. The Observatory (which has 57 members, the same number as the elected city council), will have significant power to allocate funds to popular projects taken from Madrid’s online citizen proposal platform. Sortition is finally moving in from the fringes, and the Sortition Foundation is excited to be a key participant in the Democracy R&D network, which is an integral part of that movement. To celebrate, my publisher, Unbound, has cut the price of the e-book edition of The End of Politicians: Time for a Real Democracy. On Sunday June 10, 2-5pm (British Summer Time/GMT + 1) the Sortition Foundation will be discussing strategy: what is the best way to get from elections to sortition? There will be two face-to-face meetings, one in London and one in Cambridge, with people not in either of those locations welcome to join us online. If you would like to join us, it is not too late to RSVP, just drop us an email and we will send you links to the agenda, our strategy discussion paper, and all the meeting details. Strategy Discussion: How to get from elections to sortition? When: Sunday June 10, 2-5pm (British Summer Time/GMT + 1). Where: London, Cambridge, and online. We look forward to talking with you about what you think is the best way forward. A group of friends began the collective #MAVOIX (meaning “my voice”) in France in 2015 – they all believed that the current form of our representative democracy has failed us. The idea was to bring together diverse citizens from different backgrounds to collaborate, discuss and work out how to “hack” the Assemblée Nationale by allowing everyday citizens to participate in the creation of every single law. After a first run at a local election in 2016, the goal was set to send several deputies (Members of Parliament) to Parliament after the June 2017 election. Once elected, these deputies would play a very special role. Instead of voting according to their own program or convictions, they would always vote according to the outcome of every citizen who had voted on an online platform: if, for example, 10 #MAVOIX deputies were in the Assembly, and the result from the online platform about a law was 40% YES, 30% NO and 30% ABSTENTION, then the #MAVOIX deputies would vote in the same proportions (in this case: 4 YES, 3 NO, 3 ABSTENTIONS). To prepare for the national election campaign, the collective worked for two years without any leaders or charismatic personalities. Decisions were made horizontally, after in depth discussions, always trying to find a consensus. If people disagreed, they could “fork” (a software development term), which means both options were tested. Soon afterwards, taking into account the results of the experiment, people could decide which option(s) to drop and how to improve the one they kept. This forking process was at the heart of the experimental spirit of #MAVOIX: myriads of small actions, followed by sharing of what has been learnt. An online forum, local/national meetings and open-source software were the tools used to share know-how and to deliberate on any choices to be made. And because every contributor was an expert in some area, they developed a peer-to-peer process of teaching and learning skills. For instance, students from the Political-Science University created a MOOC to help everybody understand the actual duties and obligations of an MP (Member of Parliament) during his or her term in office. In these ways contributors could help and volunteer and bring ideas to resonate with the campaign.